It takes a lot of people to keep a library running smoothly. Close to two dozen people work at GPL doing everything from laminating dust jackets to creating displays, ordering books to making sure the wireless network stays up (we love you, Reuben). Periodically here on Fourth & Sycamore we’d like to highlight the hardworking and creative individuals who make our library the very cool place it is. Neil Gaiman, who knows a thing or two about cool, says, “Every time I get to encounter or work with librarians, I’m always impressed with their sheer awesomeness.” Amen to that. Today we’d like to introduce Kaley Breaden. Kaley is one of the youngest members of our staff, and one of the most enthusiastic. Get to know Kaley a little bit with this interview, and read her thoughts on Mallory Ortberg’s new book Texts From Jane Eyre and Other Conversations with Your Favorite Literary Characters (818.602 Ortberg). Fourth & Sycamore: How long have you been working for GPL? Kaley Breaden: I have been working at the library since November 5th, 2012. F&S: What kind of work do you handle at the library? Kaley: I work in Cataloging, cataloging all the non-fiction, music, and DVDs. I also work at the reference desk helping patrons in need. F&S: What were your favorite books/authors as a kid? Don’t you hate it when someone reads over your shoulder? 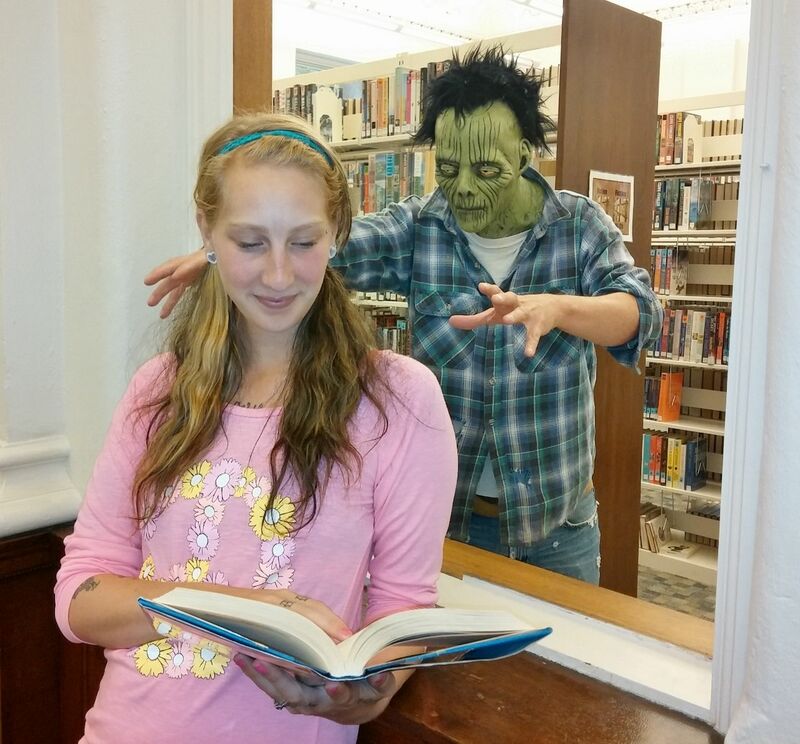 Kaley is way too into her book to let a zombie distract her. Kaley: I was really into Disney books and Dr. Seuss books as a child! F&S: How about as a teenager? Kaley: I really loved Louise Rennison (YA Rennison) books when I was growing up. The Perks of Being a Wallflower (YA Chbosky) also helped me when I was growing up…realizing it’s okay to be an outcast! F&S: What was the first book that ever made you cry? Kaley: The first book to ever make me cry was My Sister’s Keeper by Jodi Picoult (Fic Picoult). Words can’t explain how much I love this book. F&S: If you could step into the world of any fictional book you’ve ever read, what would it be and why? Kaley: This is a tough one. It would be a tie between The Walking Dead (741.5 Kirkman) and Harry Potter (YA Rowling). The Walking Dead would be cool because it would be a raw world. It would just be about one thing, Survival. Now if we go the other way, Harry Potter… It would be amazing to just be able to have secret powers! See all these marvelous things you wouldn’t be able to see in a real world! F&S: If you could only read the books of five authors for the rest of your life and no others, which authors would you choose? Kaley: Robert Kirkman, Stephenie Meyer, Cormac McCarthy, James Frey, and Tucker Max. F&S: Describe your perfect fantasy place to read a book. Kaley: I would love to be able to read a book just in front of the Eiffel Tower in Paris or at the Trevi Fountain in Rome. F&S: What is the most recent book you’ve finished? Kaley: I just finished The Walking Dead Book 9 and 10 (741.5 Kirkman). F&S: What book have you read in the last year that you want more people to read? Kaley: I would love more people to read The Shack by William Young (Fic Young). “Mallory Ortberg, co-founder of the website The Toast, is branching out to her first book. With such a humor-packed website I knew this book would be a hit. This book is about your all-time favorite literary characters in text message form. The book is split into 4 different parts if you want to flip to your favorite part for a quick giggle. The Harry Potter version was so funny it had me wishing there was more. The book is indeed very funny, and actually serves as an excellent introduction to some of the classic works of fiction it references. It would be wonderful to see this book used in a high school literature classroom as a way to not only make older or more intimidating texts fresh and funny for teenagers, but also to help expose legitimate themes and subtexts in these works. Ortberg’s writing on The Toast and elsewhere online is wickedly funny while also containing insightful social commentary, and Kaley and I (and Ortberg’s growing legion of fans) are hoping Texts from Jane Eyre is only the first of many books to come! Don’t miss out. Check out Texts from Jane Eyre today. Thanks again to Kaley for sharing some of her interests and insights with us today. 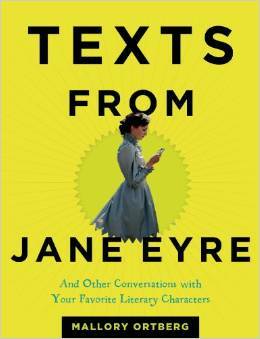 Come on in to GPL soon to check out or reserve Texts from Jane Eyre, or one of the other great books Kaley mentioned! Such a cool interview! The library’s fortunate to have both David and Kaley! You both do such a great job.